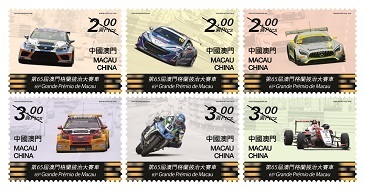 Stamp Issue "65th Macao Grand Prix"
Following its debut in 1954, the Macao Grand Prix now has a history of 65 years. 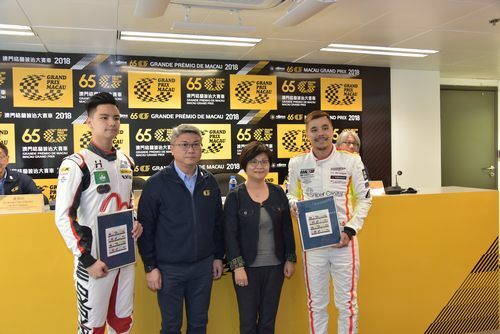 To celebrate this special event, Macao Post and Telecommunications Bureau will issue the stamp theme “65th Macao Grand Prix” on 15th November, 2018. 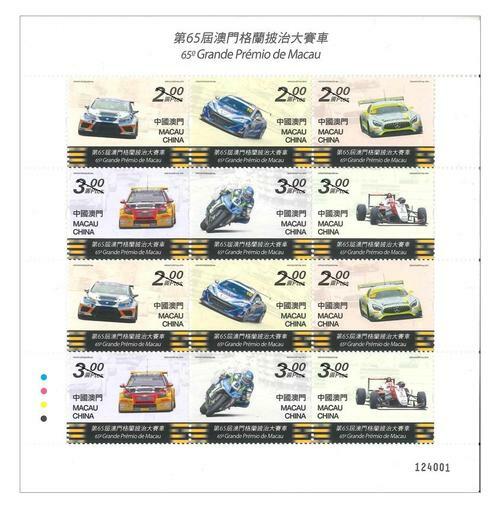 This issue includes a set of six stamps, the stamp design illustrates the world’s finest road racers include cars, motorcycles and Formula 3 twisting on the Guia Circuit. From a small club race organized by local motor-racing lovers, the event has developed into an internationally acclaimed sports event as of today. 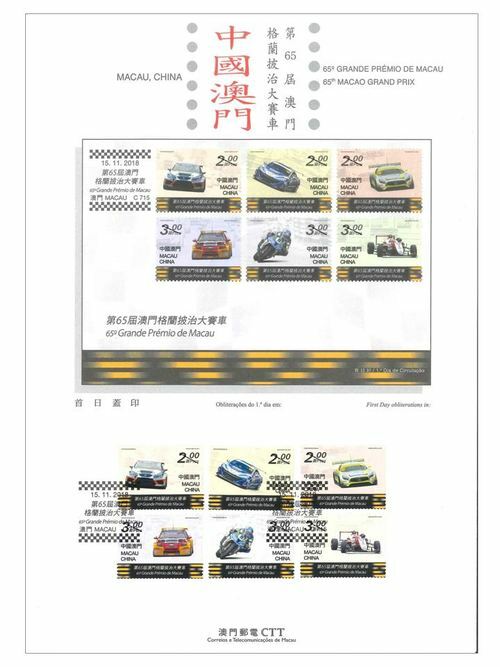 Recognized by the Fédération Internationale de l'Automobile (FIA), the Macao Grand Prix is held in the third week of every November. Throughout years of development, the Macao Grand Prix has seen the expansion of its scale and scope of influence beyond the region, holding a unique and prestigious position in the motorsport world. 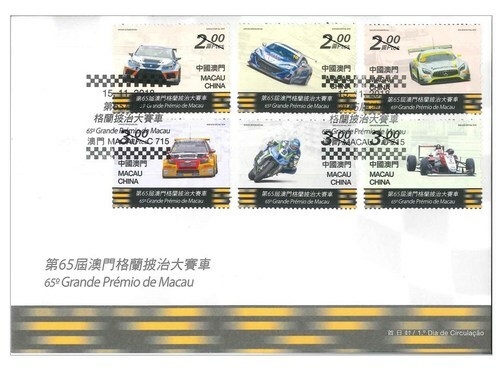 The stamp designer of this issue is Mr. Carlos Gonçalves, and the text of the information brochure is written by the Sports Bureau of Macao Special Administrative Region Government. This is the last of the twelve themes in 2018. The previous issued stamps are “Lunar Year of the Dog” on 05/01/2018, the label stamp “Lunar Year of the Dog” on 31/01/2018, “Macao 2018 – 35th Asian International Stamp Exhibition (I)” on 01/03/2018, “Mainland Scenery VII” on 12/04/2018, “Classic Fables and Tales” on 30/05/2018, “Joy” on 26/06/2018, “Chapas Sínicas (Chinese Documents)” on 06/07/2018, “Masters of Chinese Literature – Tang Xianzu” on 27/07/2018, “60th Anniversary of the Publication of Macao Daily News” on 15/08/2018, the label stamp “Macao 2018 – 35th Asian International Stamp Exhibition (II)” on 21/09/2018, “Macao 2018 – 35th Asian International Stamp Exhibition (III)” on 23/09/2018, “Birdsongs and Spring Flowers” on 09/10/2018, “15th Anniversary of the Establishment of the Forum for Economic and Trade Co-operation between China and Portuguese-speaking Countries (Macao)” on 12/10/2018, and “Hong Kong-Zhuhai-Macao Bridge” on 30/10/2018. 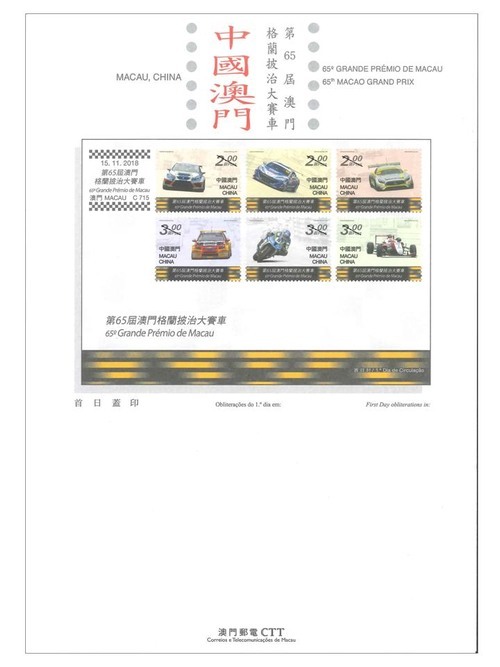 Technical Data of Stamp "65th Macao Grand Prix"